This historic home in Boulder is being converted into apartment units by Urban Green Development. Bringing the building up to code presented some unique challenges in achieving energy efficiency. The experts at Kinzler Construction Services installed closed cell spray foam insulation to get to R-50 at the roof line. Batt insulation was used in much of the home and blown-in-blanket (BIBS) was installed in some areas because of its ability to form to small gaps and oddly sized obstructions. The finished project resulted in outstanding thermal performance and excellent sound control. Contact us today to see how Kinzler Construction Services can partner on your next project! Builder Chalet Homes came to Kinzler Construction Services looking for the best options for insulation value and sound reduction for this large, new, Englewood home. 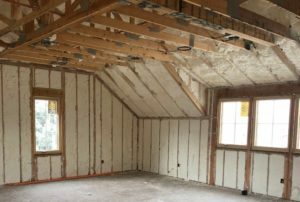 Our local insulation experts recommended open-cell spray foam, batting and blown-in mineral wool insulation for the interior walls – to reduce sound transmission. Contact us today to determine what product is most cost-effective for your next project! The Passive Fire Protection You’ve Wanted All Along! Ask us about installing NEW Cavity-SHIELD multifamily, concealed-space, noncombustible fiberglass batts! Cavity-SHIELD fiberglass is National Fire Protection Agency (NFPA) 13 compliant, noncombustible and cost-effective insulation. It is designed for use in concealed spaces between floors within wood-framed multifamily housing. Simple installation: Batts are friction-fit into cavities, without the need for special equipment, reducing the time and resources required for installers to complete the job. 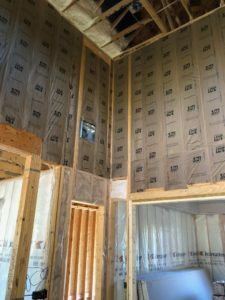 Cost-effective alternative: Cavity-SHIELD is another option for construction professionals looking for passive fire protection and a cost-effective alternative to blow-in or sprinklers in the interstitial space. Sound control: Expect noise between floors to reduce significantly. Contact us today to see how we can partner on your next project! Minnehaha Townhomes located in Minneapolis, MN. Frerichs Construction came to Kinzler wanting a cost-efficient insulation solution for new Minneapolis townhomes which will be Energy Star Certified. The 16 new homes at 5368 Riverview Rd. will be dedicated to families experiencing persistent homelessness and owned by the Minneapolis Public Housing Authority. 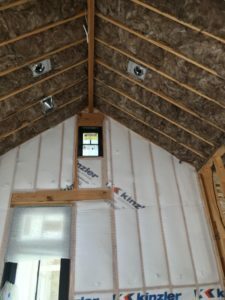 Kinzler Construction Services installed batt insulation, vapor barrier membrane, spray foam at the rim joists and cellulose in the attic. Our expert installers took extreme attention to detail to pass Kinzler’s quality inspection, city inspection and a third-party inspection for Energy Star Certification. Whataburger restaurant located in Tyler, TX. Kinzler Construction Services insulates new restaurant in Tyler. When you’re enjoying the great food inside Tyler’s newest Whataburger restaurant, you can also enjoy the building’s comfort thanks to a quality insulation install from Kinzler! This project required some problem-solving from our expert team because the 2×6 roof trusses did not allow space to install the specified R38 insulation using a traditional staple-in method. Instead, our installers did a “wire-up” install, using nails and 16ga galvanized steel wire to hang the batt insulation into place. As always, the project was inspected for quality and the customer was very happy with the speed and quality of the installation! Custom home located in Denver, CO.
Sealing this Greenwood Village custom home for energy efficiency was a top priority for the team at Esprit Homes. They contacted the local experts at Kinzler Construction Services to spray foam the attic chutes, box sills and rims. Fiberglass batting and blown-in-blanket (BIBS) were installed in the walls. We followed our proven process for quality installation by inspecting the completed job and grading our installers on the quality of their work. 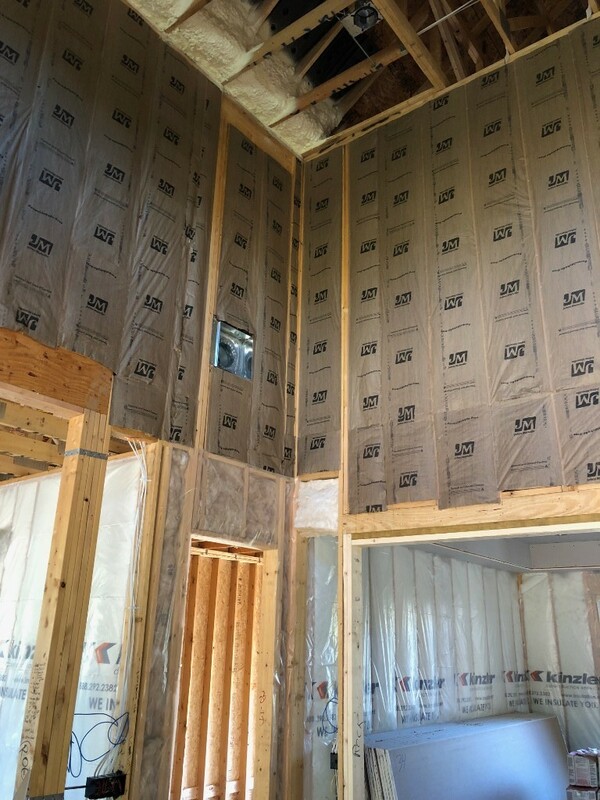 Kinzler Construction Services installed R-23 Blown-In-Blanket (BIBS) in the walls & batt insulation in the ceiling to achieve an R-value of 38. This project required much problem-solving from our expert installers due to the large amount of vaulted ceilings needing batt insulation. Kinzler delivered, keeping the contractor’s project on schedule.